We are all moved out of our house, and the new owners have officially taken the keys, it is a really good feeling to be all done with the hard stuff! I'll do a blog post on that soon, but, today a recipe, because it has been a while. Now that we are getting a bit more normality back into our lives, we are trying to get back to our regular healthy meals, rather than the last minute thrown together stuff we have been eating lately, plus our fair share of eating out. It feels good to have time to think about shopping and dinners again. This is one of my favourites. When I'm feeling like something light and easy for dinner this is my go to meal. And, I love haloumi!!! Seriously cheese that you can fry in a fry pan, do I have to say more! Also, I know it isn't the typical toddler meal, but Ezra chows this down. He LOVES the haloumi too, and will eat big spoonfuls of lentils. Sometimes that kid shocks me with what he eats, but we have been feeding him a pretty wide variety of different foods since he has started solids, so I'm hoping he will keep his great eating habits! The strangest thing that he loves is the pickled ginger that you serve with Sushi! Follow the instructions on the packet of Lentils for cooking, and I usually just estimate how much I need depending on the size of the group eating. Squeeze half of the lemon and approximately 1/4 cup of Olive Oil into the bowl, and stir in. When the lentils are almost ready, fire up a fry pan, add a teaspoon of oil and sliced haloumi. Cook the haloumi until it is crisp and golden on the outside. Strain the lentils, and add both them and the haloumi to the bowl and serve. As it is Tuesday, I'm linking up with Jess for #IBOT and Stacey at The Veggie Mama for Meatless Monday! 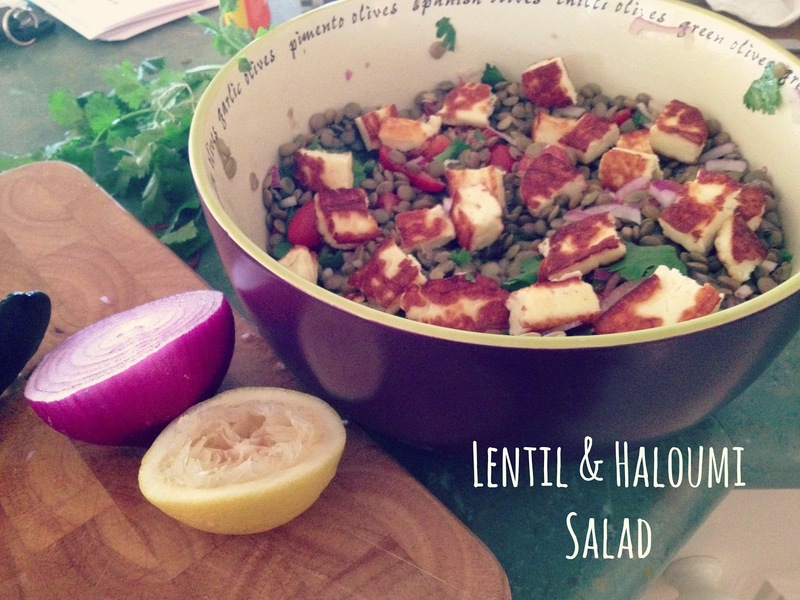 21 comments on "Lentil and Haloumi Salad"
You had me at Haloumi! I love it too, Mmm. Not sure about the lentils, but I would def make this to take to a BBQ where people would actually eat something awesome like this. Unlike my children... very boring eaters! I love haloumi...what a wonderful cheese! I wish my toddler was a more adventurous eater. Actually he will eat some strange stuff...he loves octopus...but he won't eat things that I think he should like...for example potatoes! Give the lentils a chance!! ha, they really are so yum!! But yes great to wow people at a bbq for sure! You certainly can't, it is just soooo good!! OCTOPUS!!!! Whatttt thats awesome, it is funny how they will eat things you never imagine they would like, but then hate normal stuff! Aroha seek it out at the grocery store..you will thank me later, just remember to fry it in a pan, seriously best cheese ever! congrats on the move! that salad looks amazing, every time i read your posts i feel hungry and sad - hungry because i want some - sad because i can't have any! hmmmmmmmm fried haloumi - really can't go wrong can you? Oh my this sounds delicious! I love haloumi, don't mind lentils either. And it looks simple enough - might have try this one, thanks! We can't do lentils here. They give a certain husband terrible, terrible wind!! My Mum tells me if you soak beans and lentils and things beforehand it actually stops you from getting gas from them!! But, if it is that terrible I'm not sure you would be willing to face the consequences if it didn't work!! Really, really simple!! Lentils are pretty good, I am a recent convert to them! Yum! looks delicious....haloumi+lentils+fresh toms = heaven! Ooh, anything with haloumi is good with me so this looks delicious! Will be adding this to the to-try list for sure! Haloumi and coriander? you are a genius! My thoughts exactly!! Some of my favourite things! I know, haloumi makes everything taste better! I can't get enough!! They are a great match for sure! !